Home » Audio/Visual » Cinema » It: Chapter One -There’s more to fear than monsters and clowns. It: Chapter One -There’s more to fear than monsters and clowns. Pete and Rosa went to see It, the latest interpretation of the 1986 Stephen King novel; because who doesn’t love losing sleep over supernatural clowns? Pete: I’ll be honest, I was as nervous as I was excited to see the movie It. I was 14 when the 1990 miniseries came out, featuring Tim Curry as Pennywise the clown and a slew of familiar TV actors (John Ritter, Harry Anderson, Seth Green) and i was only slightly older when i first read the book. And both times I ended up terrified with a week’s worth of nightmares. So, now older and no less terrified of clowns, I wasn’t sure how the story of It would translate to traditional movie length, even when told in two parts. 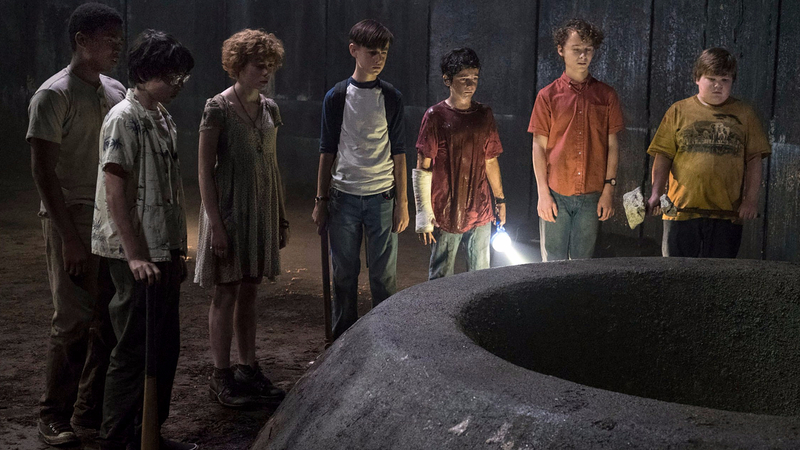 This first part, features the children (the Losers’ Club) who are forced to face a supernatural entity that has been terrorizing their town for centuries. Rosa: “He thrusts his fists against the post, and still insists he sees the ghost.” This line is prevalent throughout all forms of this story – Stephen King’s original novel, the 1990 miniseries, and again in this recent adaptation. It’s a phrase that one of the main characters is set up to repeat to rid himself of his stutter, but becomes a mantra of futility and anguish, both in its ineffective treatment of the speech impediment, and the utter failure of our protagonists’ initial attempts to rail against their own fears. The story of It on its surface is very simple – good vs evil – innocent children pitted against a murderous entity. The way this story is explored is a little more complex, however, and my anticipation of how this new forum would present itself built with every preview. Pete: It is a horror story. But it’s also something else entirely. Beyond the fright and the supernatural mystery, it’s a story about sadness, loneliness and dread- the slow kind of fear that works even without sewer monsters. And that makes it all too real and all too familiar. Rosa: On the surface as a horror story, It delivered with some fright moments. In some instances I knew what was coming, as the story followed the original book, but small new visual details and flourishes added by the filmmakers created new scenes out of old stories. How does one match the utter masterful performance of Tim Curry’s Pennywise? By allowing the actor to let the character’s rage seethe to the top, pull back, and then adding subtle CGI embellishments that increase menace and discomfort. Rosa: While the clown is the central avatar of the evil forces, the scare comes from sense of place, and how one fits there. This movie did an excellent job of placing you in the realm of a thirteen year old child – with all the insecurities, budding sense of self, and continued need for parental support and approval that came with that age frame. A large portion of the fright in this movie came from relating to the children’s feeling of helplessness, both outside their homes and within. They felt the menace of bullies, racism, and bystander apathy, with little to no support from adults. Rarely do I hear friends recounting nightmares of clowns, wolfmen, or vampires; I could write books about the number of times I’ve heard about scary dreams revolving around being stuck back in middle or high school and losing significant control over situations, however. Every big scare in this movie centered around that type of power imbalance and isolation…followed by a scary friggin clown. Pete: The changes from book to movie when it came to introducing each child and their particular nightmare were pretty substantial. But to me they each still caught the spirit of the book. Each scene gives us a new opportunity to jump from our seats, and each one gives an insight to each member of the Losers’ Club. And ever-present is Pennywise. I am curious how someone who’d never seen the miniseries in their youth would react to this Bill Skarsgård Pennywise. For me, despite him being amazingly creepy and perfectly monstrous, there were far scarier things in the town of Derry. Portrayed far more disturbing and honest to the novel, in particular are Bev’s father and the Henry Bowers’ gang of bullies. Nothing creeped me out more. These are real and familiar monsters, given much more power over the kids. Rosa: Changing the setting of this movie to the late 80’s absolutely capitalized on the current trending nostalgia. Rather than being a quaint story from a removed past, it pulled me and my…ahem…age bracket right back into middle school. Pete: It was the kids who I felt brought the most to the movie. And while we don’t yet have the second half to see the way the adults are portrayed, the younger cast had something the miniseries never seemed to nail. It felt familiar – natural and realistic. The original miniseries seemed to portray kids the way adults imagine them — they never didn’t feel like child actors in over their heads. But in this film, I recognized my childhood. Rosa: I think the main kids were also flushed out to be, well, real kids. Stan was scared of a painting on a wall? My aunt had a painting of Mexican Jesus that managed to always lurk behind you in the facing mirror — art is scary AF! Richie’s inability to allow a sentence to pass without inserting innuendo and jokes? I strongly suspect the screenwriters recorded my entire seventh grade existence and used it for inspiration. The hopeful gleam in Ben’s eyes every time Bev was nice to him? Let’s…let’s just not get into that awkward heartbreak. I felt like I knew these kids – they weren’t just the Burger King Kids’ Club randomly strewn together to fill a personality trope quota; these were friends that were drawn together by commonalities and, perhaps, some cosmic force. Pete: I felt a little let down by some of the bonding moments between the kids that are more present in the book. There was a point where it felt like someone realized that It needed to wrap up soon, and they used a pretty unsatisfying trope to get the kids to the creature’s lair that took some agency away from Beverly. That part was disappointing. Rosa: I also genuinely missed the mystical element that banded the Losers’ Club together in the book and the 1990 miniseries. The kids ultimately come to realize that “if we work together we can do more harm,” but this feels like a throwaway trope. We already know that teamwork makes the dream work. If we don’t have a common set of beliefs, sense of purpose, and trust, then it all falls apart. This crew felt a little more like seven kids who were all failing math and decided to make a study group rather than the universe’s appointed champions for the forces of good. While I recognize the empowerment of individuals coming together to stand against corruption, the broader scope of their bond was lacking. This wasn’t just some blood-thirsty phantom they were fighting – it was the seeping sickness of oppression, exploitation, fear mongering, and blatant hatred that was infecting the entire town and worming its way into society. The kids in this movie created a formidable team, no doubt, but I didn’t get the sense that their bond was capable of seeing them through more hardship, or even compelling enough to bring them back to Derry in 27 years…you know…in case It returns. Four red balloons out of five. 3 Comments on It: Chapter One -There’s more to fear than monsters and clowns. I am so excited– and a little bit pukey– to see it!!!!!! Awesome breakdown! I can’t wait to see it!